Disaster struck from the moment we walked onto the departure platform to find our carriage and board the train. I saw carriage after carriage of four-berth air-conditioned soft sleepers. I was devastated. From reading various blogs I was under the impression this SE5 train only had air-conditioned hard sleepers, air-conditioned soft seats, air-conditioned hard seats, and ordinary hard seats. But here I was looking at carriages filled with soft-sleepers. Maybe my eyes were deceiving me, but I learnt a valuable lesson that I will now pass on to you. When booking your train tickets, regardless of what you’ve read online, ask the person you’re buying the tickets from whether the train you want to use has the kind of seats or sleepers you’re looking for. We wanted soft-sleepers where possible, but the trains we thought had them didn’t fit our schedule, so we went with soft seats for this leg…big mistake. We boarded the train and it was clear from the moment we stepped foot in the aisle that our packs were not going to fit in the overhead storage racks. So one of our packs ended up on the floor in front of us, seriously diminishing the amount of leg room we had, and the other was wedged upright between our aisle seat and the seat in front. It was too big to go all the way in, and the other pack on the floor at our feet was blocking it in any case. So most of the pack was in the aisle, which blocked people and the food trolleys trying to get past. So here we were, three of us wedged into a seat and half with no foot room for the next seven and a half hours. However, there were a few saving graces. The air-conditioning worked, it would have been a disaster if that had of packed it in. The people on the train were incredibly friendly. The Vietnamese absolutely love Jack, constantly touching and stroking him, sometimes even trying to take him out of my arms to have a hold. It’s constant, and if you have any reservations about people touching your child, this is not the country for you. There were a couple of other children on the carriage so Jack made some new friends. There was also what seemed a never-ending procession of food carts making their way up and down the aisle for most of the trip. Chicken soup, corn on the cob, noodles, chocolate, cake, water, coffee, tea and plenty of other food and drink was always available if we needed it. We arrived in Nha Trang right on time, got off the train and walked straight into a waiting cab that if I didn’t know better could have thought it was waiting especially for us. Truth be told, despite the cramped conditions, the trip wasn’t too bad. We only chose that particular train because it departed and arrived at reasonable times, especially when considering Jack’s sleeping patterns. 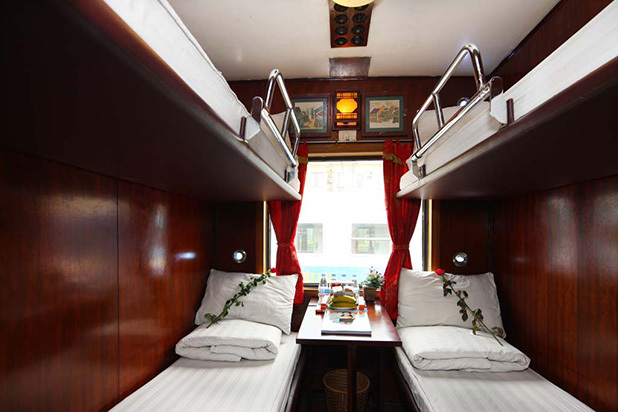 However, for the next leg from Nha Trang to Danang, where we’ll take a taxi to Hoi An (there’s no train station in Hoi An), we’ll be ensuring we get a soft-sleeper regardless of departure and/or arrival times. We will have much more space, somewhere for Jack to sleep that is comfortable (and not on me), and we’ll be able to do some work on the blog that I was hoping to do on the first leg. 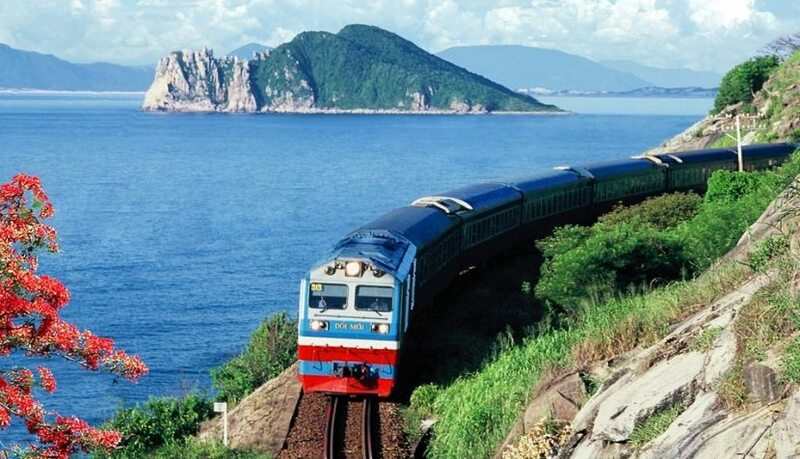 We didn’t purchase our tickets from the train station on our arrival into Nha Trang because although we’d booked to stay for four nights, we were open to staying longer if we were really enjoying ourselves. As it turned out, while we had fun, we were happy to stick to the original plan. We wanted to purchase our tickets a few days early to ensure we got a soft-berth cabin, and the train station is too far to walk, so we enquired at a few tourist outlets around town. Unfortunately they added a little more than we wanted to pay on top of the ticket price to organise it for us, which is fair enough, so we asked the hotel if they could organise the tickets. 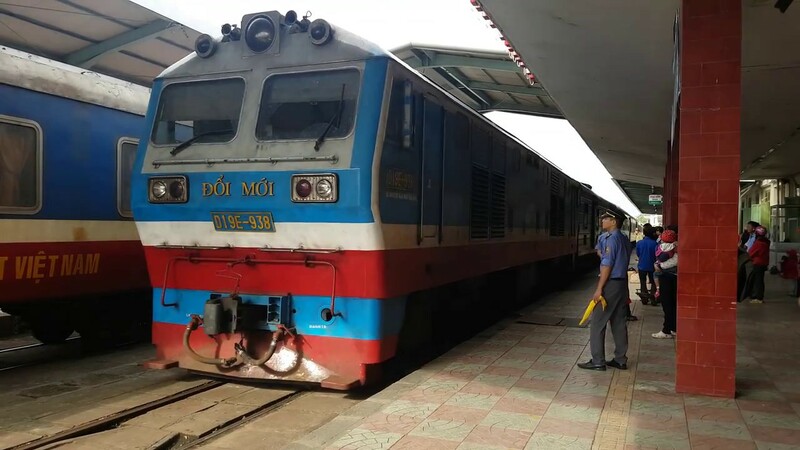 As it turned out they were more than happy to do it at no charge, the only addition to the ticket price (641,000VND, $AU32) was a 30,000VND ($AU1.50) delivery fee charged by the train station. We were more than happy to pay, and it saved us from a trek out to the train station. We will definitely be using this method to buy our tickets everywhere we go if the circumstances are the same. We arrived at the station at 5.15am for our scheduled 5.36am departure and there were people everywhere. I was shocked, it could easily have been 3.00pm given the activity outside the station. We decided to break up Jack’s diet, and provide him with a bit more fibre by buying some Weet-Bix and milk for breakfast, but we didn’t have a bowl. So I asked a lady manning a food cart if she had a disposable bowl I could have. Thinking she’d understood my request she started racing around the station in search for me. About 10 minutes later, exhausted, she returned with two packets of two-minute noodles. Not exactly what I requested, but after a few more hand gestures, and the assistance of other locals who spoke about us much English as I do Vietnamese, she came back with a proper bowl and two spoons. She quoted 15,000VND ($AU0.75), I handed her 50,000VND ($AU2.50) and got 15,000VND ($AU0.75) back. Now I’m no mathematician, but this didn’t add up. It may not sound like much, but a deal is a deal, and considering she’d already turned her back on me I wasn’t going to accept defeat. The banter was good-natured and 30 seconds later I paid 20,000VND ($AU1.00) which was still a pretty good deal. We joined our new travel companions Ewan and Dawn, a lovely Scottish couple from Glasgow on their honeymoon, who were relaxing on the top bunks while we organised ourselves on the bottom bunks. The sheets and cabin were clean, and we could travel in peace with the simple slide of a door. There was no peace and quiet in the soft seats of Leg 1, what I would have done to have a ‘cone of silence’ lower from the roof Get Smart style to drown out the noise in there! There was ample storage room for our packs, a light for each bed and a wall socket to power up any dying electronic equipment. Even the toilets and wash facilities were slightly cleaner. And most importantly there was room for Jack to get up and move around. We could get his toys or iPad out for him to play on the bed, or we could go for a walk around the carriage in relative comfort. Ahhhh bliss. We didn’t know what to expect with the food, we were assuming the same carts that patrolled the soft seat section would simply make their way from one end of the train to the other. How wrong we were. We first bought a couple of gelatinous rice snacks with meat in the middle wrapped in banana leaves, but these weren’t particularly nice, so we bought some chicken soup from the next cart a few minutes later. Then a man came into our cabin with a menu for us to buy lunch…hello I thought, this is a nice surprise. There were only two options, chicken and rice or pork and rice, but it was a nice touch. We didn’t know what to expect, but when lunch time rolled around our man returned with a couple of lovely meals of chicken, rice, soup (of course) and vegetables. We were soon hoeing in when another cart soon followed with a selection of meats to purchase. Needless to say I bought a few pork rolls wrapped in what looked like spinach leaves (these were amazing), a huge chicken drumstick and some pork skewers. I love my food and I loaded up. There were also whole quails (we think that’s what they were, although the waiter said they were chickens) and a couple of fish options as well. There was a little table between the lower level beds for us to rest our lunch trays on, but more importantly it made writing articles and producing videos for our travel blog much easier. I even got an hour of sleep, which is not that easy when you have a two-year old boy, work to do and plenty of countryside to see. 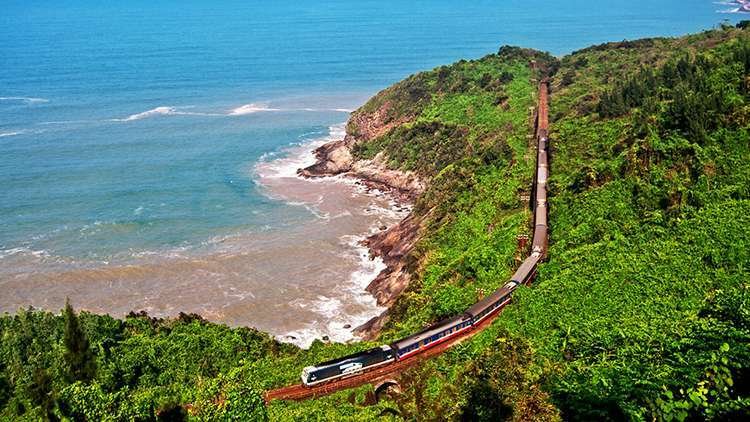 That was another bonus of this trip, while the scenery of the first leg was dry, rocky and totally uninspiring, the scenery from Nha Trang to Danang was lush and beautiful. 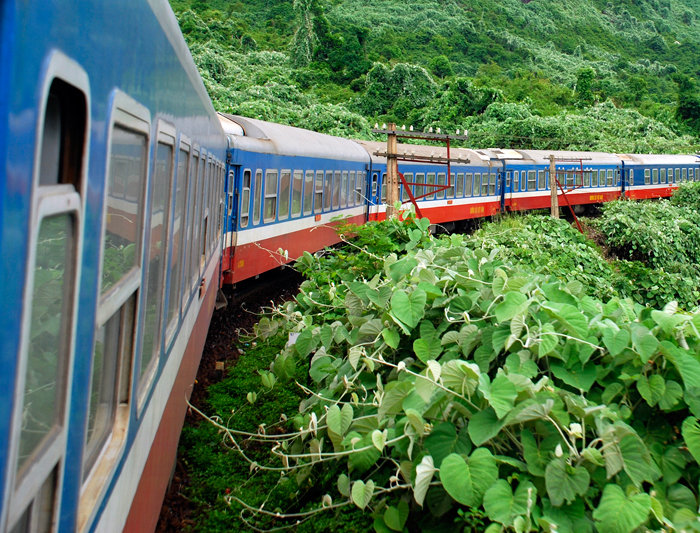 The train wound it’s way through the countryside and by the coastline, with lots of locals working the fields and various produce drying in the sun offering a fascinating look at rural life in Vietnam. When we boarded the first thing we noticed was how nice the cabin was, slightly better than the cabin we had in the second leg, which we were more than happy with. The second thing we noticed was the top bunks were empty, and we knew we were one of the last people to board the train. Surely we couldn’t be this lucky, but as the train started to pull away from the station, Sarah and I could hardly contain our happiness. 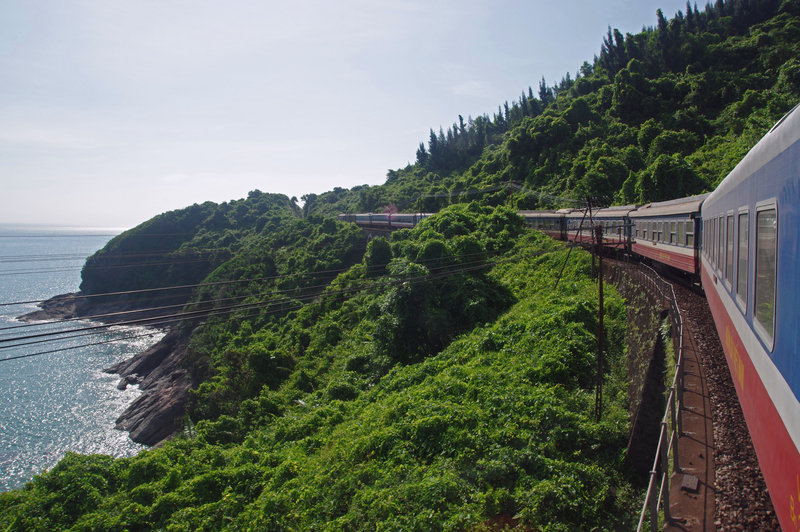 We didn’t know if the train was going to stop anywhere during the night to take on more passengers, but at least there would be a large chunk of the journey where the cabin was just for us. I went for a bit of a walk through the carriages in both directions, and to my surprise a lot of the cabins were either empty or at least weren’t full. A lot of happy people on the train tonight I thought. We didn’t bring much food with us because from our experience on the first two legs there was so much to purchase. However, after 90 minutes not one trolley had passed our cabin, and from my earlier walk up and down the train I knew there wasn’t a kiosk or food carriage. We were beginning to wonder if we’d made a huge mistake given Jack was getting a little restless and my stomach was starting to grumble. Just when we thought we were going to go hungry, or at least eat Jack’s Weet-Bix for dinner, we heard the familiar rattle of the food and drinks carts. While we were delighted the food cart had arrived, there wasn’t as much to choose from this time around. In fact, whether we liked it or not, we were having chicken and rice soup for dinner as that was the only choice! So we bought three bowls and we sat down for dinner.